Doge’s Palace, La Basilica, the Salute, the Frari: the list of Venice must-sees is far too long for most travelers to take them all in during their allotted sightseeing time. Needless to say, the less-famous, must-see-if-you-can-squeeze-them-in venues are too rarely enjoyed by the one-time visitor; for those who return, or become regular Venice devotees, they eventually begin to dot the sightseeing horizon. One of these gems is the Museo Fortuny, once home and laboratory to the extraordinary Mariano Fortuny — painter, photographer; textile, lamp, and garment designer. Belonging once to the Pesaro family and donated to the city in 1956 by his wife Henriette, the palace has been transformed into a lean, evocative exhibition space and inviting museum. The permanent collection includes lamps, wall hangings, paintings, furniture, and Fortuny’s own laboratory, maintained in a manner that you expect Fortuny himself to return at any moment and start work on some engaging project. Now is the perfect time to discover the Fortuny if you haven’t yet got around to it: until July 18th, it’s hosting three exhibits that are not only intriguing in their own right, but are also highly complementary each other. The first is City of Cities, by Francesco Candeloro. 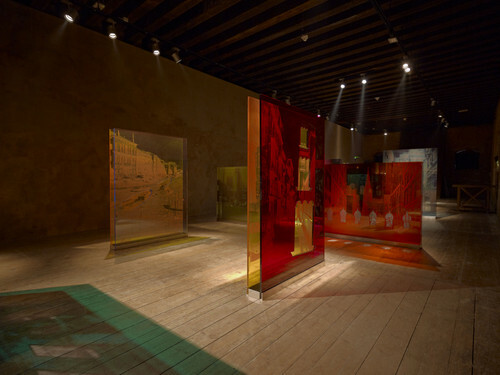 Wander through city scapes of multicolored, multidimensional floor and wall installations of plexiglass, laser-cut motifs and UV-printed images; a show designed for the space itself. The floor above houses Silk and Velvet, an intoxicating showcase of Fortuny’s famously sensuous, finely-pleated (plissé) silk Delphos dresses and accompanying garments — all displayed in the space where they were created. The third exhibit on the top floor is Samurai, a fascinating collection of surprisingly varied, intricately decorated, elaborately crafted armor, helmets, and accessories worn by the powerful Japanese Samarai military, of the Koelliker collection in Milan. Scanning the rows of assembled armor and carved masks, admiring the expert workmanship, you almost expect these warrior figures to leap up, with swords raised high, and charge the crowd. 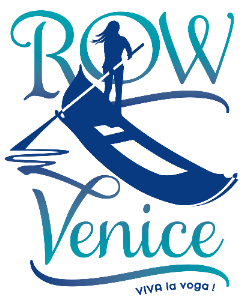 This entry was posted in About Venice, Exhibitions & Museums on March 31, 2010 by Living Venice. The disabled may have a problem at the head of the stairs where there is a firedoor and no handrail. The floor in front of the firedoor sloped and my wooden leg whose stiff ankle does not conform to the floor made me fall. I reported it to the director by e-mail but had no reply. Sloping floors need handrails. The floor near the desk at the entrance was not well lit and I had to feel ahead with my stick to make sure that there was nothing to trip on. I love the Fortuny – it’s my favorite museum in Venice, and finding it is half the fun. Unfortunately it was closed during our last trip last December (more renovations apparently) – so I’ll just look forward to visiting again later this year.